Glacial LED Track Light 30W with Mounting Options. The solution for accent lighting in commercial stores and even residential areas is engineered by Ledison Lighting. 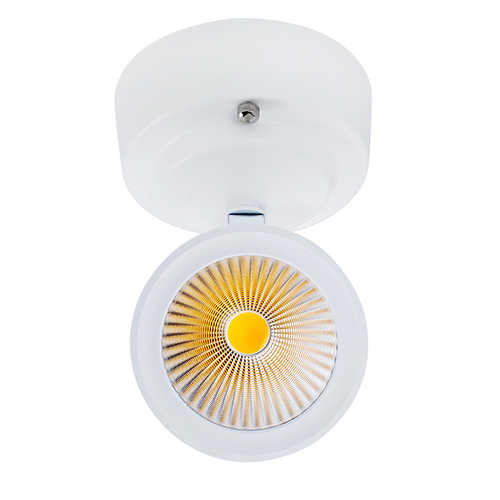 The CITIZEN LED Chip on Board at 30Watt emits warm natural or cool white light in 38° and 20° bean angle. Featuring an internal power supply the LED Track Light can be installed directly to the mains using standard single-circuit and three-circuit tracks. It is made for special accent lighting on products or decorating items (such as pictures and paintings) as well as for making a cosy atmosphere in any other space (living room, dinning area). This type of LED spotlights are used in showrooms of all kinds, art galleries and places where the products change constantly. Our GLACIAL track light is available with three different mounting systems, if a tracking system is not available the spot light can be mounted directly on any ceiling using the surface-mounting kit. It is completely adjustable and allows the use to point the light anywhere on the product or space. LED Track Light with 30W Chip. 38 degree beam angle. Suitable for singe-circuit and three-circuit rails.This product is suitable for direct connection to the mains voltage (100-240VAC). Technical Specifications Single & Triple Track Spot Light.